An important meeting will be held at the Heritage Centre, St. James Church, on Saturday 12th December at 11am. Please come if you can. We need your support. The Mayor of Wirral’s Christmas Tea Dance is set to get the festive season off to a glittering start, 1.30pm – 4pm on Wednesday 9 December at Wallasey Town Hall. The annual dance is taking place in aid of the Mayor of Wirral’s charity appeal, with all money from tickets going to benefit the Wirral branch of the Alzheimer’s Society, Clatterbridge hospital’s League of Friends and the North West Air Ambulance. Tickets cost £5 and people can also give an early Christmas present by sponsoring a ticket for an elderly person who might struggle to find the money for their own ticket, through a list of those who would like to attend provided Age Concern. Presenting on the day will be BBC Merseyside’s Linda McDermott with the ‘Under the Duvet Crew’ and Lillie Moore with show songs from the heart. To get dancers truly into the festive mood, there will be mince pies, sandwiches, cakes and hot drinks, made by Wirral Met College catering students. The Mayor of Wirral, Cllr Les Rowlands, said: “Christmas is a time of year when the community comes together, enjoying each other’s company and having a good time. You don’t need to be a good dancer to appreciate the Christmas Tea Dance, it’ll be a fun afternoon for all and full of festive cheer. “I want to thank the college and everyone who’s given their time to make this event possible. Tickets and sponsored tickets are available for £5 from the Mayor’s office on (0151) 691 8527, or by visiting the town hall. The Heritage Centre are looking for Volunteers who could spend 2 hours each week welcoming Visitors to the Centre,watching local history DVD’s and talking about New Brighton’s fascinating history. If you are able to help with this project phone 639 5798 to discuss which days you are available. Thank you. As a sector we have seen public sector cuts take effect and we have all had to make some difficult decisions. Speaking to organisations, their main concern is the impact on their beneficiaries; some of whom are the most vulnerable in our society. The cuts, added to other Government reforms, have been fast-paced and, at times, difficult to navigate. However, we need to look to the future and ensure we are in the best position to take advantage of opportunities as they arise. Our Council is on a journey to become a commissioning Council; this will open doors for more services to be delivered via the Voluntary, Community and Faith (VCF) sector. This is something we need to be ready for in order to build on our reputation as having the innovation and capacity to bid for future contracts. With this in mind, we have developed the “Looking to the Future” survey to give the VCF sector a voice in these turbulent times. The survey aims to identify the level of service provision available in Wirral. This information will be vital if we are to evidence that the VCF sector can continue to support our beneficiaries in the future. A few issues ago, I wrote about The New Brighteners’ aim to see New Brighton become Polystyrene free. We always knew it would be a big task. In addition to the environmental issues, there are economic issues. For instance, it is more expensive to use environmentally friendly food containers rather than polystyrene. This is an important issue for small independent food retail outlets, and not to be ignored. This brings us round to the use of polystyrene containers by event caterers, which inevitably get strewn around the landscape and beaches. Events such as the Rally Stages along Kings Parade, and running events such as the 10K and Half Marathons, leave in their wake polystyrene containers, cardboard boxes, empty sugar and sauce sachets, plastic spoons, forks and bottles and empty gel energy packs, all of which are very bad for the environment, and make New Brighton look a mess. However, we’ve recently discovered that the polystyrene problem cannot begin to be tackled for one major reason. Wirral Council does not have a specific polystyrene policy. Yes, it was a surprise for us as well. The city of Oxford has proposed that Polystyrene take-away food containers should be banned, and similar bans have already been imposed in a number of US cities and towns. The New Brighteners have begun to work with Wirral Council, particularly liaising with our New Brighton Cllrs; Rob Gregson, Pat Hackett and Chris Spriggs and with Cllr Bernie Mooney (Environment and Sustainability), to develop an official Polystyrene Policy. Once this is done, and it will take some time as these things do, then the Council’s event team can instruct caterers concerning no polystyrene use. Then we can begin to see a change in polystyrene use. Toxic chemicals leach out of styrene products into the food that they contain (especially when heated in a microwave), which threaten human health and reproductive systems. Hydrocarbons are released during polystyrene manufacture, which, in the presence of sunlight, form tropospheric ozone – a serious air pollutant at ground level. Polystyrene is dumped, in significant amounts, into the environment as litter, and is a major component of plastic debris in the ocean. It is notorious for breaking up into very small pieces that choke animals and clog their digestive systems. Furthermore, discarded polystyrene does not biodegrade for hundreds of years and is resistant to photolysis (the breaking down of material through the absorption of [sun] light). There are lots of alternatives to Polystyrene……. Recycled paper, bamboo, corn plastics, etc. are easily renewable resources that can be used instead of Polystyrene for take-out fast food containers, whether for fish & chips, burgers, tea, coffee etc., AND all of these products are biodegrade and easily recycled. So let’s all begin to move away from polystyrene, and all work towards…. Help to keep the Community Centre open!! We have had a busy year again with our lifeboat and hovercraft in action on a regular basis with 40 call outs at the time of writing. A particular feature of call outs this year has been people cut off by the tide and we can but stress again the need to understand the tide times and learn when its safe to venture onto the sandbanks. The tide sweeps in along gullies rapidly surrounding sandbanks and at different rates according to height of tide and force and direction of wind. The outer sandbanks are usually covered at very least 3 hours before high tide and the inner ones soon after. Tide times are available on the web, via our website, for smartphone and tablet users Apps are available and they are also produced in booklet form. W inter also sees many storms hitting our coast often with dramatic seas at New Brighton especially with a North or North West wind blowing. This combined with high tides can see massive waves breaking over the sea wall, fort and lighthouse. With virtually everyone having some sort of camera available its tempting to try and record the action. If you do then stay well away from the slipways they are lethal, use a telephoto lens and keep well away from the sea wall. All sorts of debris carried along with the waves can drop on you from a great height and won’t do you or your camera any good! If you do end up in the water in these conditions your chance of survival are slim. In conjunction with the Light Cinema, New Brighton we are putting on a unique event featuring a series of short films covering the Lifeboats of Wirral from the stations of New Brighton, Hoylake and West Kirby, each one operates quite different craft. This will be followed on with films of ‘The Queens Salute Liverpool’, ‘Battle of the Atlantic 70 year on’, ‘Farewell to HMS Liverpool’ and ‘The Other Three Graces’ – which is to do with historical ships not the Pier Head buildings. Afterwards there will also be a chance to chat to some of the lifeboat crew in the foyer. The films have been produced by local filmmaker Graham Mathews and have not been shown on the big screen before. Tickets should be available from the *Light Cinema from early December and cost £10 each – this includes entry into a raffle with lots of prizes – perhaps an ideal Xmas stocking filler for those who love the sea!. Happy Christmas from the Black Pearl! 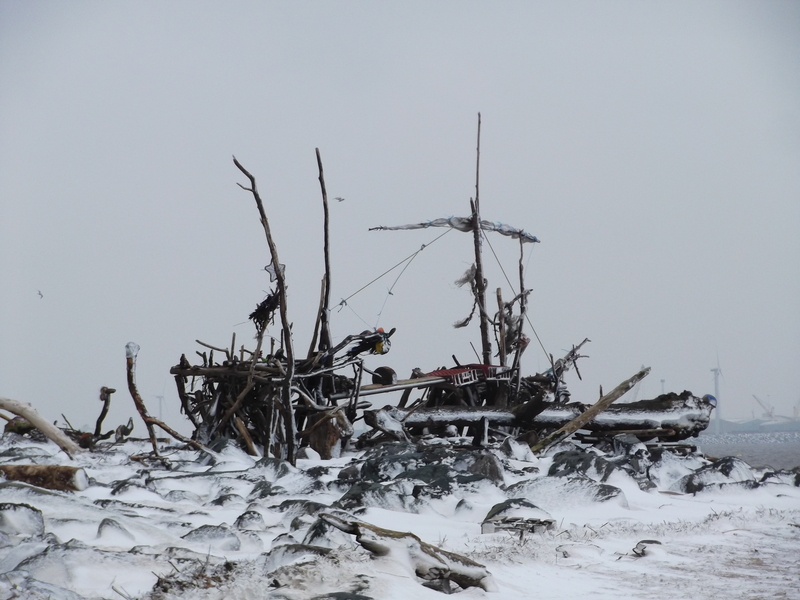 A winter’s scene – The Black Pearl in January 2013 – very cold fingers for Major and me and quite a few people wondering what on earth we were trying to do! Over these past three years, and especially over 2015, I have felt that the days, the weeks, the months are racing by far too quickly. And here we are at Christmas time again! Yes it is the season when we hope to give a bit more time to those around us and especially those closest. A time of year to take stock of where we are, what we have done and what happens next. Easy enough to recount what has happened but, it has gone. Looking ahead is what I do worst – but with great hopes that sometime I will get it right! A safe prediction is that the Black Pearl Pirates will be out and about at the Seabank Road Christmas lights bash on 5th December – Phyllis told me it was the 5th but bearing in mind that I get things wrong – check it out! Moving on, and with help from all those good people who have already volunteered, the Christmas Nativity will be appearing somewhere not too far away and slowly but surely converging upon a little-known inn just across the prom from the Black Pearl. I will personally be celebrating Christmas on the Pearl at some time and as I may feel moved to play(?) guitar and sing(?) that will only be suitable of the tone-deaf, the desperate and my closest relatives and friends. Miss that one if you can. As some people will guess I am about to go off on one. And it is going to be quite personal. For much of my life I have hoped to find something I am really good at, and I have got through life alright but without ever finding that special something. However over these past few years, in the short period of time spent living here I have found that the voyage of discovery can be more enjoyable than arrival. Children have often asked us how we made the Black Pearl. We answer the children as best we can but in the main we work by trial and error. Sometimes we get it wrong and have to undo it and start again. There are satisfactions in trying to do something, in the search for solutions, the thrill of possibilities, getting it wrong is part of the experience and maybe the “how” has still to be invented! It seems that discovering this for myself has made me much more aware of the amazing things that so many people are doing all around me. Over these past few years I have seen so many people in New Brighton trying something new, something not done before, with no blueprint, with no guarantee. People are doing wonderful things throughout our community, so many people working in so many different areas – in a school there, a shop here, a café, anywhere and everywhere. Unless you go there yourself you may not see them or hear about them but the stories are growing. They do so much with so little and the doing of the task seems to be reward enough. I salute them! I salute them everywhere, but especially here in our own place where these continuing endeavours, personal missions, acts of bravery, attempts at the impossible, aspirations without limit so inspire our community and enrich our joint and individual experience of living – and of living here. A very happy Christmas to all who work in our community! Everyone is welcome, please come & join us in celebrating the birth of Jesus this Christmas! Fr Phil, Fr Michael & Sr Jo would like to wish everyone a very happy & holy Christmas. Firstly I would like to introduce myself, I am 0166 Beckie Clarke and I am a new Police Community Support Officer for New Brighton along with my fellow PCSOs Darren Widdowson and Rob Parkinson. We work with partner agencies as well as local members of our community in order to create a safe neighbourhood to live and work in. Remove all valuables from your car or van such as satellite navigation systems, mobile phones, MP3 players, laptops, money and handbags etc. 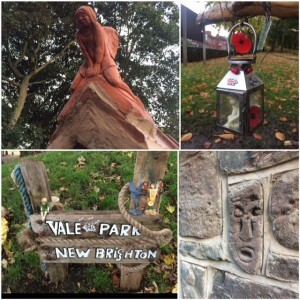 There has also been a recent increase in anti-social behaviour in Vale Park and the surrounding area. We have increased patrols in the area, identified the individuals involved and in partnership with the Wirral Antisocial Behaviour Team, home visits have been conducted or letters sent to those involved. We also held a community meeting with residents and other agencies at Vale Park Café to discuss the issues. Reports and sightings of anti-social behaviour have since decreased. Please do not hesitate to ring 101 if you see any anti-social behaviour in your area. Recently we have executed a warrant on a suspected drug dealer’s property as a result of information obtained from members of the community. If you see any suspicious behaviour or believe drug dealing may be happening in your local area please do not hesitate to contact us on 101 or ring Crimestoppers anonymously on 0800 555 111. We hold regular surgeries at New Brighton Community Centre, Hope Street every 2nd and 4th Monday of the month. Please come along and see us with any queries or concerns. Finally I would like to thank you all your continuous support and look forward to working with you all in the future. Police Community Support Officer 0166. Here’s a link to our Main Christmas extravaganza called ‘The Road to Bethlehem‘. Vale Park was opened to the public on 20th May 1899. 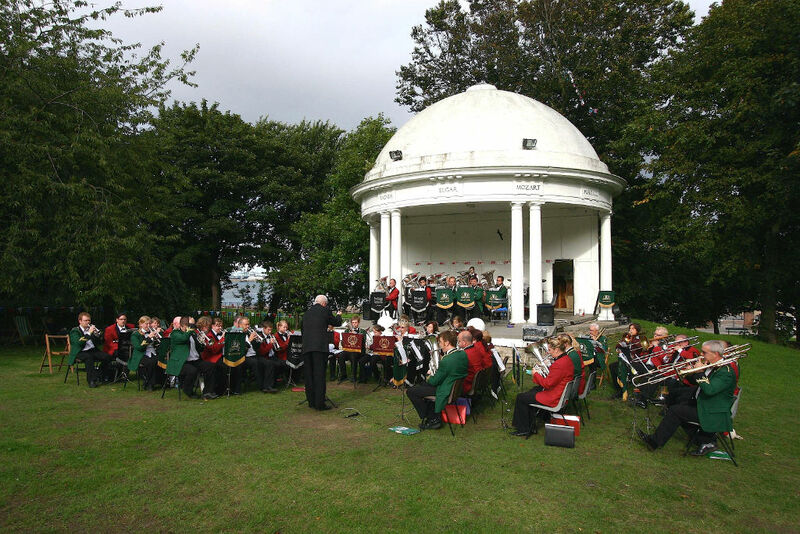 The Band Concerts have been a feature since the first day, when the Tranmere Prize Gleam Silver Band played the crowd in with the National Anthem. Since then many famous bands have played in the park, including works bands like Grimethorpe, Fodens, Fairey and Cammell Laird. The building of a doric-columed bandstand with a domed roof was opened on 21st August, 1926 and it provided a majestic backdrop to the concerts. The bandstand was built by Messrs. Boulton and Paul, of Norwich and the reconstructed stonework and plastering was carried out by Messrs. Crotch and Son, of Norwich. It is still used by the bands on Sundays during the summer. The Vale Pa rk Driftwood Fairies evolve in a subtle way. We remember the magic of Joy Time’ with Aunty Dorothy and Uncle Norman by placing a fairy finial high on an outbuilding and below an ancient face looks out, could that be Uncle Norman? We discover a piece of driftwood with the name of a Scottish woodwork firm exhibited on a brass plaque, this was transformed into the Vale Park sign and we are in contact with the firm to try and find its origins. A silver lantern is found on the tide line we recognise it as part of the candlelit memorial service held for PC Dave Phillips at Fort Perch Rock…RIP. This was transformed into a memorial to remember the fallen on armistice day. 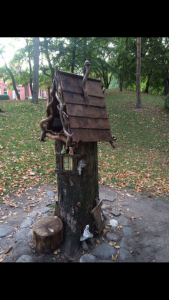 Many, many people have visited the Fairies and left gifts of jewellery one special gift of hand crafted prisms dance merrily in the Autumn breeze on the Troll tree. We thank you all on behalf of the fairy folk. We do have first some bad then to counteract some good news. Bad news fistwe had a complaint from a resident regarding the fairy bell in the centre of the village…just didn’t like the jingle… so with respect to their wishes we have removed it. Good news nowwe have muffled the jingle and have put it back in place. We will celebrate the forthcoming festive season with whatever the Mighty Mersey delivers to our shore line… Watch this space. 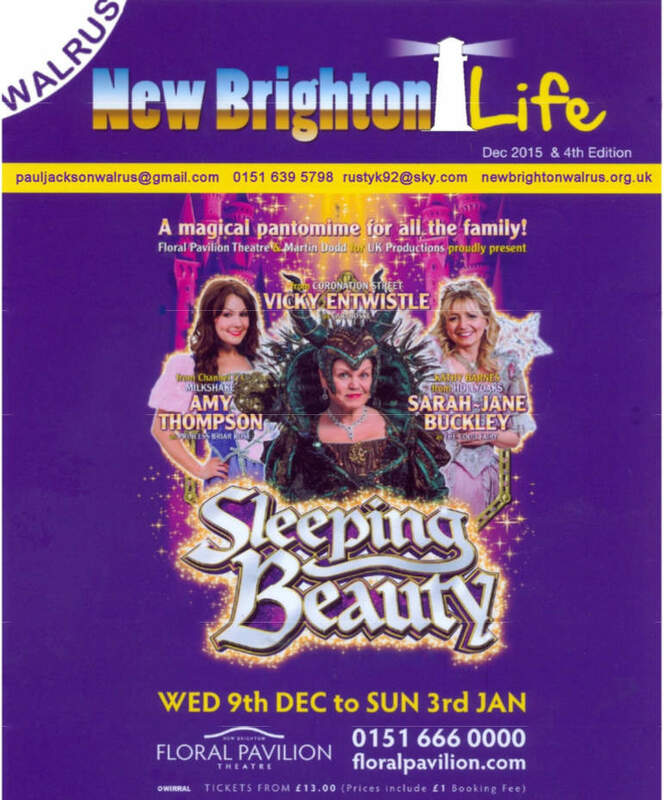 New Brighton Community Centre – Tuesday evenings for 1 hour. Have you or your partner ever worked on the ships out of Liverpool? If so, did you know there’s a Citizens Advice service dedicated to you? Seafarers’ Advice and Information Line (SAIL) is a Citizens Advice service for working and retired seafarers all across the UK. All our advice is free and confidential. Our professional advisers can help you with a wide range of problems, from pensions, benefits and charity grants to housing and consumer problems. For example, Gordon called SAIL in September. He lives in New Brighton and had worked as a steward for Cunard for over 25 years. He wanted to know the details of the government’s new rules on pensions. His adviser, Helene, took him through all his options so he could understand the choices he could make. She explained how much he would be taxed for each different option. In the end he decided to take some money out of his pension pot to go on a Caribbean holiday with his wife in the New Year. Earlier in the year Diane called SAIL shortly after her husband died. He’d worked on tankers all round the world but had lived all his life on Merseyside. We were able to help Diane get some money from the government and a charity grant to help with the funeral bill. We advised her which organisations to contact to inform them of her husband’s death, and made sure she was getting all the benefits she was entitled to. We also helped her with some of the practicalities of tidying up her husband’s estate. She’s now trying to get used to life without her husband of almost 50 years. If you think Seafarers’ Advice and information Line can help you or your family, please call 08457 413 318 or email advice@sailine.org.uk . The help line is open from 10am to 4pm weekdays, and we’ll always call you back if the number is expensive for you. There’s much more information on the SAIL website www.sailine.org.uk . Roy Castle Lung Cancer Foundation has a number of retail shops across the Wirral area and we are currently looking for volunteers to support the amazing work in our Liscard and Moreton shops. We are looking for people to help with in coming stock rom clothes, bric-a-brac, books as well as a number of ‘new’ stock items. If you have a few free hours a week to volunteer and if you are reliable, friendly, and enjoy working as part of a team, we would love to hear from you. … And lots of games, laughs and fun along the way for a memorable Christmas. that you have made someone’s day and given them a great start to the New Year. This edition of Walrus brings us a new production with a new printer. Yet there is much in it that has not changed. Rusty Keane is still our editor and New Brighton should be grateful for the amazing community service which she has provided over the years both by editing this magazine and in many other ways. 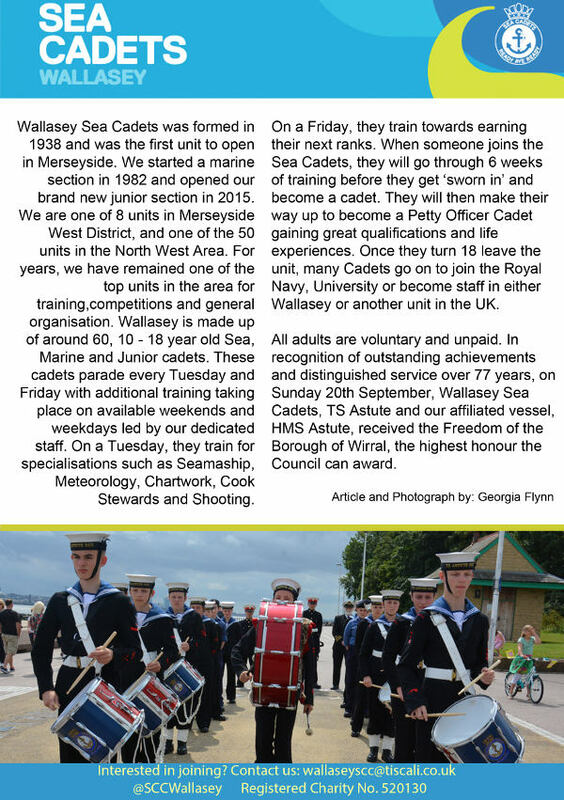 The aim of Walrus is still to publicise the wealth of local activities which we are privileged to enjoy in and around New Brighton. Personally I am grateful that this includes the programmes of the local churches. This can be particularly valuable at Christmas when all our churches offer a friendly and imaginative selection of services and other activities. I was sad to read in a recent survey that these days a sizeable proportion of our population see no connection at all between Christmas and the Christian Faith. Then they wonder why they find so little joy at this time of the year. ‘Cos you’ll feel foul on Boxing Day! Of course there can be much more to Christmas than over-eating and over-drinking. Christmas is a good time to go exploring. The extra leisure time allows us to explore more of our wonderful Wirral. Also why not explore at a mental and spiritual level? Take your Bible off the shelf and have a look at the second chapters in St. Matthew’s Gospel and St. Luke’s Gospel and the breathtaking opening verses of St. John’s Gospel. Or if you are prepared to plumb the depths of the theology of Christmas, try the opening verses of Ephesians, the tenth book in the New Testament. Happy Hunting! Christmas Eve Midnight Communion 11:30 p.m.
Come and join us at New Brighton Baptist Church as we gather to celebrate God amazing Gift to us in His son The Lord Jesus Christ.